Check out what happened the first time Dad planned a trip to Disney World. It was one of those perfect Florida late spring mornings. The sun broke over the horizon and danced lightly on the perfectly manicured, dew covered lawn. Birds (real ones) sang softly from the abundant foliage. The early morning colors exploded trumpeting the start to another lovely day. The Plan was succeeding beyond my wildest dreams. We had stopped at the Disney Travel Center in Ocala the day before and found a great price on upgrading to the Polynesian Village hotel. When we checked in the gave us a room in the Pago Pago building, perfect. We are less than 100 yards from the TTC. When the alarms went off this morning, the kids jumped right out of bed. They're so excited. The Man-Child absolutely loves the day bed. He thinks it was put in the room just for him. He's already got a nest built. The Princess got to sleep in a bed all by herself. She's pumped. She has her and her brothers autograph books packed and ready to go. The Plan was working brilliantly. The girls brought breakfast while the boys got ready. We walked out of the room and went right to the monorail. We walked right to the front and asked to ride with the driver and he said yes. It was awesome. 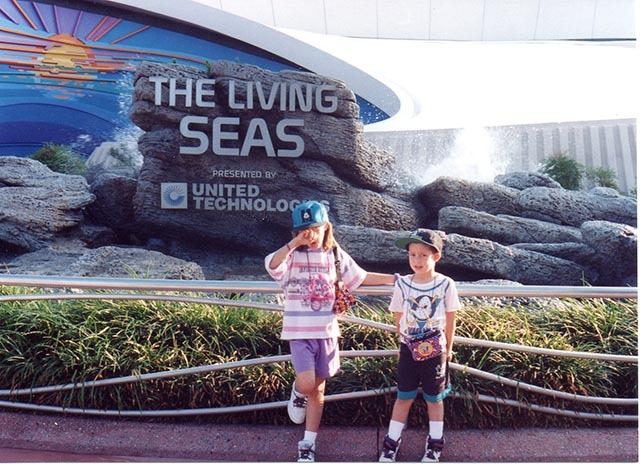 We jumped off the monorail and ran right over to the Living Seas. The Plan called for getting the Living Seas done and then rushing over to Body Wars. It was perfect. There was no line. We walked right on to the Hydrolator. (Did you know those things only moved 2 inches. I'd a swore it was at least 10 feet.) The Man-Child loved the fishy's. He could have spent all day in there. We came out of the Living Seas and I started to rush us over to Body Wars when IT happened. "Why can't we go into that building, it looks like fun?" someone said innocently. "What Plan" Mrs. Mom asked. "Where did this plan come from?" she asked. "The Plan, it came from above." I said trying to put a humourous end to this useless bickering and get back on schedule. We were now 5 minutes behind The Plan. "I'd like to see this plan." She said. It was time to put an end to this. We were rapidly loosing time and lines were getting longer each second. It was time to put my foot down. The Plan was a thing of beauty, and once I shared it with the family and got everyone on board, The Plan worked perfectly. I had spent hours researching and developing a plan. The only problem was I didn't take time to let the family help develop it. We sat down that night and went over The Plan for each day. Everyone made suggestions, and we improved on The Plan. Once we all agreed, The New Plan was great. The trip was great. We had a blast.